Signing on will be inside the Sheffield Town Hall. Signing on will start at 17:30 and will close 20 minutes before each event so that the updated sheets can be delivered to the finish area. Licences will be kept for the duration of the race and returned on receipt of the race numbers. Riders failing to present a licence will be charged a full Day Membership (£10.00) for both races and will riders have to pay the statutory fine (£10.00) for the National A Race. Junior riders will be subject to a gear check before being allowed to sign on. A random gear check will be carried out following each event. The Pits will be situated on Pinstone Street. The area will be controlled by a Commissaire and one lap out per rider will be allowed up to 5 laps to go for mechanical faults and punctures. The rider involved must report to the ‘Pits Commissaire’ and show them the fault. Please make sure that your gears and wheels are adjusted or tightened properly. In the event of a crash, the riders directly involved may come to the pits and ask the ‘Pits Commissaire’ for a lap out, with up to 5 laps to go. To get to the pits, riders must go around the course in the direction of the race. Any rider observed taking a short cut will be refused a lap out. 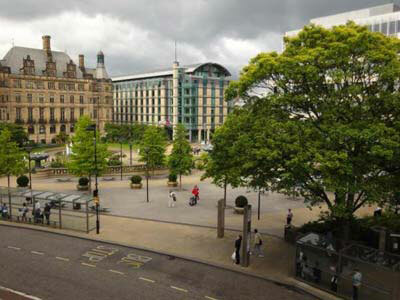 Sheffield Town Halll is in the heart of the City Centre, situated at the top of the Fargate. Exit the M1 at Junction 33 and take the “Sheffield A630” exit and follow signs to Sheffield City Centre. The A630 merges into the A57 and continue into the City Centre. When you see Matalan on your left get into the right hand lane and take the ring road off to the right. Follow the road under a bridge and continue forward until you go over the River Don. Branch off to the left, signposted “Riverside” onto Corporation Street. At West Bar roundabout take the 2nd exit onto Tenter Street – A57 which is signposted Glossop. There will be a Fire Engine Museum on your right. Continue up the hill and at the roundabout by Kwik Fit take the 3rd exit and turn left at the traffic lights for Rockingham Street Q Park car park. Alternatively take the 2nd exit at the roundabout onto Townhead Street. Head up the hill and branch right onto Trippet Lane. Sheffield Town Hall is only a short walk from here. Website Design by Blue Strawberry Elephant. © 2018 Sheffield Grand Prix.